Free download WinDirStat (Windows Directory Statistics) latest version. WinDirStat is a free utility program designed for windows operating system that gives detailed information about the hard disk. WinDirStat can be called a disk usage analyzer. The application is inspired a software that has the same functionality, and was developed for Linux operating system, named as KDirStat (a KDE application). It was released in October 2013. 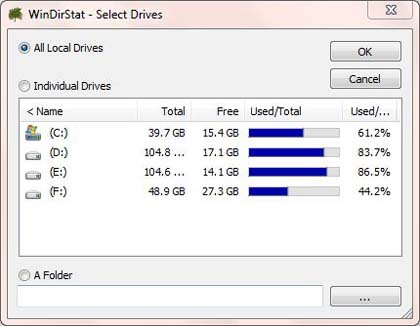 WinDirStat tells all the details of your hard disk drive usage. It also classifies the information in groups of files extensions with the space used by them in upper right small window. For example, it can tell you that how much disk space of your hard drive is used by all of the mp3 files. The software tells the details both in units and percentage. In the half lower part of WinDirStat, you can see a graphical map of your hard drive usage in combinations of different colors. This utility program has so much popularity that it has been downloaded about 10 million times from the official site of the software after its release.